Waimate was an iron full rigged ship built in 1874 by J.BLUMER Co., Sunderland for British Eastern Shipping Co., Liverpool with her first name HINDOSTAN. Her dimensions were Length: 66.9 m. Width: 10.7 m. Depth: 6.3 m. and 1156 GRT, Rigged with sky sails. Sold 1875 to New Zealand Shipping Co., London, and was renamed WAIMATE. The New Zealand Shipping Company, founded in 1873, began its operations with two sister ships and, the next year, ordered a second pair to augment their service. Both the latter had long and successful careers and one of them, Waimate, soon acquired a reputation as the smartest and fastest clipper on the New Zealand run. Designed with two decks, she had accommodation for about 350 emigrants as well as a few berths for cabin passengers. 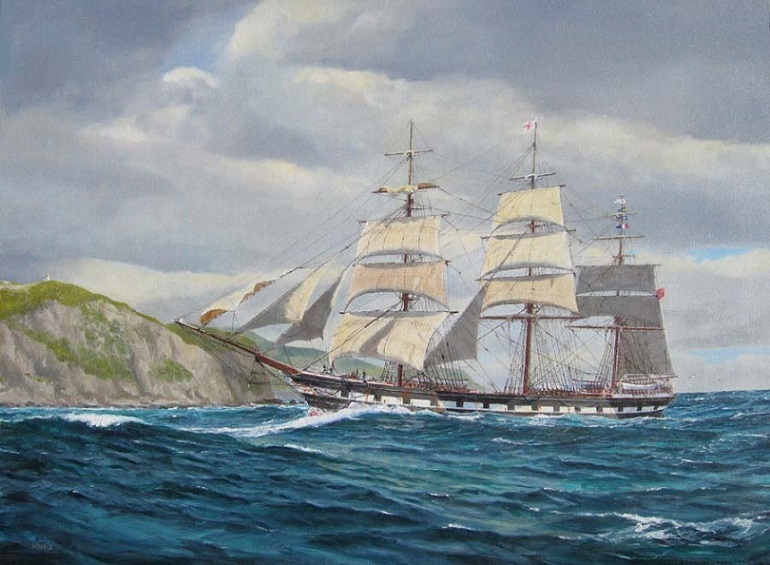 On her maiden voyage under Captain Rose, she sighted Lyttelton (New Zealand) 84 days out from the Lizard, a much better than average time and the precursor of things to come. A well-constructed ship maintained in splendid condition, Waimate proved hugely popular and rarely sailed from England with spare capacity. In 1880-81, under Captain Peck, her second master, she created a record passage time of 73 days, London - Lyttelton (66 days 'land to land') which stood for many years. After twenty-two round trips to New Zealand, she was sold to Russian owners in 1896 and renamed VALKYRIAN. Thereafter relegated to cargo only, she left Newcastle, New South Wales, bound for Iquique, Chile, with a full cargo of coal sometime in 1899 but disappeared at sea and was never seen again. The design stamp is made after painting of Roger Morris: «Ship Waimate passing Pencarrow Head and entering Wellington, taking in sail before a fresh southerly». 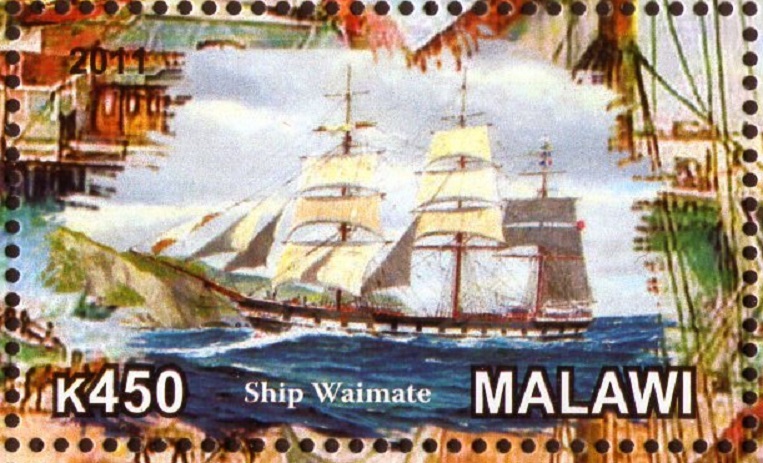 The design stamp is made after painting of Roger Morris: «Ship Waimate passing Pencarrow Head and entering Wellington, taking in sail before a fresh southerly».